Egypt’s shipping and transportation industries have suffered significant losses due to the curfew imposed in 14 governorates. The interim cabinet re-introduced a state of emergency, along with a curfew, on 14 August, following bloody clashes between supporters of ousted Islamist president Mohamed Morsi and security forces after the latter dispersed two major sit-ins in Cairo and Giza. The curfew, which was not welcomed by couriers, has been shortened to last from 9pm to 6am, as street violence has abated. In the first week, curfew hours were from 7pm to 6am. Magdi Abbass, chairman of United Co., a large local shipping company, told Ahram Online that the curfew had hit his business, as the heavy presence of military checkpoints on roads and highways had delayed deliveries to customers. "I have estimated the drop in revenues at 50 percent per day, in addition to raising the salaries of truck drivers because it takes them longer to make deliveries than before," Abbass said. The current curfew has been strictly enforced, unlike on other occasions. Checkpoints actually hold violating vehicles and pedestrians overnight until the curfew ends at dawn. 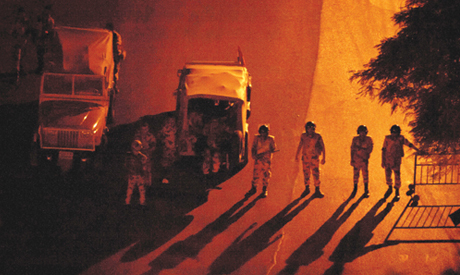 Cairo experienced a major curfew during the uprising against Hosni Mubarak in early 2011. It was much more loosely observed and never stopped demonstrators from staying in Tahrir Square or significantly reduced traffic inside big cities. In January, Morsi declared a month-long state of emergency in Egypt's three canal cities (Suez, Port Said and Ismailia), which entailed daily 9pm-to-6am curfews. It was barely observed and citizens were filmed playing football with soldiers who were supposed to enforce the curfew. Tarek Safwat, spokesperson for shipping company Maersk Egypt, told Ahram Online that the deteriorating security situation had impacted the firm in terms of import and export volumes, as it had become very difficult for customers to move their containers to and from the ports. "Thirty to forty percent of our local volume has been affected by the curfew, alongside the closure of Salam Bridge (one of the main gateways crossing the Suez Canal to Port Said's east terminal)," Safwat explained. Economists expect the Egyptian economy to grow by just 2 to 2.5 percent in the current 2012/13 fiscal year – matching the increase in population – due to the security situation and political crisis. "Egyptian exporters might not be able to meet their long term commitments due to the difficulties of transportation inside the country," former finance minister Samir Radwan predicted. Some consumer products have run short in several areas because of the curfew. Mohamed Othman, head of marketing at Egypt’s cigarette monopoly Eastern Company, said several areas in Upper Egypt are suffering shortages and price hikes because the company is struggling to deliver cigarettes to the region. "We have seen an indirect impact on our sales, which are hit with losses worth LE5-LE8 million per day," said Othman. Complaints about the curfew extend to the public sector. On Sunday, Abdullah Fawzy, head of the Egyptian Co. for Metro Management and Operations, said the curfew had caused losses worth LE500,000 per day, or 60 percent of the underground services’ daily revenues. The Egyptian Public Transport Authority (PTA) is sustaining losses of around LE1 million per day as the authority has trimmed the afternoon shift to end at 8pm due to the curfew, says Ali Fattouh, head of the PTA workers' syndicate. PTA has two shifts, the first from 5am to 3pm, the second usually taking place from 4pm to 1am.